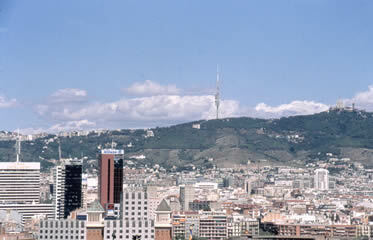 It is a walk by the city of Barcelona and its surrounding area, where everybody can participate. It has international echo, in order to let everybody know the wonderful beauties and particularities of the city of Barcelona. In 2001 there was the first International Walk in Barcelona, but its vocation was decidedly towards continuity. In 2002, the proposal was enlarged, and there were two different routes, one of 11 km and another one of 21. Another novelty was to give them a thematic condition. The Modern Style was the chosen proposal for that year. Its third edition, in March 2003, followed the same pattern than the last one, but it was dedicated to let the visitors know about the different public parks and gardens of the city. Its fourth edition, in October 2003, a big change appeared: now, the visitors had 2 days to walk in the city (a weekend). This change had a double purpose: to enlarge the number of routes and, at the same time, to adapt this activity to the rules marked by the IML (International Marching League) in order to become one of its members. In 2004 edition, the proposal of routes was widened. Those routes were created having into account the great attractions of Barcelona. It is, also, another way of making exercise in a funny way. The experience of the 2004 has been repeated in 2005. For obvious reasons of repairs in the street, the begining and end point was changed, and it was moved to the front of the Casa del Mig, inside the Espanya Industrial park. This change has been qualified as very positive, and all the walkers could enjoy of a beautiful party dedicated to them on saturday afternoon. Another changed that had to be made was the dates. In 2004, the walk was made by the end of October (and the aim is to keep doing it by the third or fourth weekend of October). But, because of our trial to become a member of the International Walking Association (IML), in 2005 this walk was made in June. In 2006, the walk was made in January 28th and 29th in order than the inspectors of the IML could come and see how we organize our walk. But the "official" version of the International Walk of Barcelona of 2006 took place in October 7th and 8th. In both days, there were 3 routes, one of 10 km, another one of 20, and a third one of 30 km long. The 10 km route was part of the walks of Barnatresc, and counted in order to obtain a pin of this activity. The begining and end point was placed inside the sports center of the Espanya Industrial, so inscriptions, party, etc, were made without taking into account weather or any other kind of problem. From the event of 2007 walk, when the CIB was just included in the IML calendar, there have been some changes in order to keep or increase the interest on the CIB by those who love these kind of activities. There will be absolutely new routes, but they will be of 10, 20 and 30 km long as before. The main goal is to have two kinds of routes: the “Llobregat routes”, that are the routes that have been present in the CIB in the previous years, and the “Besòs routes”, a new collection of routes in the other side of the city. We desire to alternate those routes, one kind a year, the other the next year, in order to be able to offer a bigger variety to the participants. In 2008, it was agreed to repeat with the “Besòs routes”, because there were some arrangements made in order to consolidate them. In 2009 we went back to the “Llobregat routes” in order to keep on alternating routes. In that edition, we applied a new marking system for the routes that go on by the Collserola Park, made with metal sheets placed in the mark posts that already existed in the park. This new system produced some changes in the 30 km route of the second day. Those changes helped to make the route better and more rational. In 2010, we used the “Besòs routes”, and we used the new marking system again, also in the Collserola Park. In this case, it also meant some changes in those routes. The beginning place of the 30 km route of the second day also changed, from Coll de Sant Bartomeu to Coll de Parpers (la Roca del Vallès). In 2011, again in the “Llobregat routes”, that needed some actualizations to adapt them to the new urban structures built during those years, like the “Ciutat de la Justícia”. There was a great success in the number of walkers who participated, about 6.000 walkers between both days. For the 2012, as it was foreseen, we’ll be back to the “Besòs routes”. As usual, they need some changes. This year, the main change will go about the pass and revictualling controls. Some of them will disappear, and they will concentrate in less places, in order to be more efficient in logistics and we’ll also be able to give the same service to walkers. In 2013 is time for the Llobregat routes, so the start and end point is the Poliesportiu Municipal de l'Espanya Industrial. Everything will go on in the same way as usual. We will continue with the experience to supress pass controls and concentrate revictuallings in less points. In 2014 we go back to the Besòs routes. There’s a new 20 km route, but the rest of them are consolidated. Our experienced organization will allow walkers to enjoy of some wonderful days of walking. In 2015, it’s time for the Llobregat routes, which are fully consolidated. We have an experimented organization that will allow walkers to enjoy of a couple of wonderful days of the most natural physical activity: to walk. This year, the start and end place of all routes will be the auditorium of Cotxeres de Sants, what will allow us to organize again both International Walk of Barcelona and Barnatresc Internacional in one same place. In 2016 we come back to the Besòs routes, with some new localizations of controls, the routes already made in 2014 and an experimented organization that will allow the walkers to enjoy of wonderful walking days. In 2017, it's time again for the Llobregat routes. There are no new things in the design of those routes, nor in the beginning and end place, that will be, again, the Centre Cívic Cotxeres de Sants. The social circumstances of our country suggested us to "rearrange" the beginning of the second day. Luckily, there wasn't any problem at all. In 2018, we will go back to the Besòs routes, with a new attraction and, also, with renewed dreams. That's why we are sure that the International Walk of Barcelona will be again a good way to be more healthy, to encourage friendships, and to rediscover the city and its surroundings. In 2019 we’ll come back to the routes of the Llobregat. We’ll go on with the iniciative that begun in 2018 in which we propose a 40 km route for the second day of the event. Last year’s route has been a great success.